We finally got our yard fenced in! Inga is happy as a clam now that she can run around sans leash. 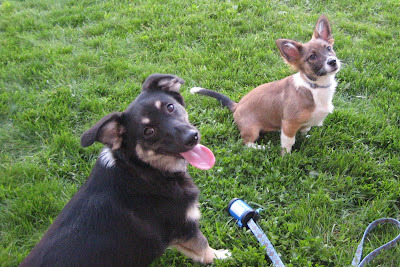 Of course, to celebrate the new found freedom in the backyard, we had to have a puppy play date :) Meet Leeluu! Such a fun night getting to play off leash in the yard! I am going to be taking the next week off from blogging, but I will be back with amazing pictures and stories to share with you all!! Take care! great dog and cat honey, they are incredible!! Oh those pups are so so cute! Oh so cute.. i'm sure they loved being able to play free.